Researchers map how calcium uptake in mitochondria during a heart attack causes large cell death. In a life-threatening situation, the heart beats faster and harder, invigorated by the fight-or-flight response, which instantaneously prepares a person to react or run. 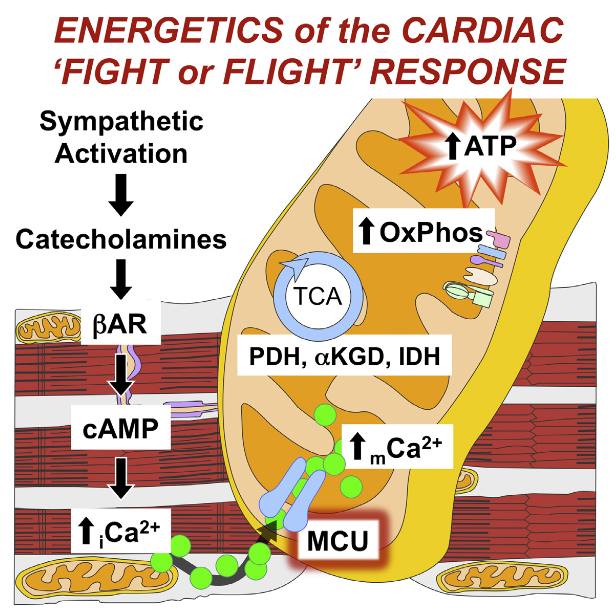 Now, a new study by researchers at Temple University School of Medicine (TUSM) shows that the uptick in heart muscle contractility that occurs under acute stress is driven by a flood of calcium into mitochondria, the cells’ energy-producing powerhouses. The opensource study is published in the journal Cell Reports. Previous studies show that calcium enters mitochondria in heart muscle cells. However, the physiological role of that process was unclear with the function of mitochondrial calcium uptake during stress generally linked to the collapse of energy production and cell death. The current study now shows that in periods of acute stress, increased calcium uptake by mitochondria in the heart functions in ways that are good and bad. Firstly, during the fight-or-flight response it provides the necessary energetic support for the heart. Secondly, during a heart attack it leads to the death of large numbers of heart cells. The team explain that in the fight-or-flight response the release of adrenaline activates numerous systems in the body to prepare for the perceived stress. A key aspect of this response is an increase in cardiac contractility. Adrenaline increases calcium cycling in the heart to drive contraction. That same calcium enters mitochondria through a channel known as the mitochondrial calcium uniporter (MCU). The researchers have been investigating MCU since its discovery in 2011, attempting to elucidate its function specifically in heart muscle cells. In the current study they knocked out, or removed, MCU from mitochondria in the hearts of adult mice. The data findings show that in mice lacking MCU the heart failed to respond to adrenaline-receptor stimulation with isoproterenol, an adrenaline-like chemical that in high doses normally sends the heart into overdrive, mimicking aspects of the fight-or-flight response. Meanwhile, in mice lacking MCU that suffered heart attacks with ischemia (blockage of blood flow) followed by reperfusion (the restoration of blood and oxygen supply), the loss of MCU was found to preserve heart tissue and increase cell survival. Without the channel, calcium was unable to enter mitochondria to trigger cell death. The team state that the effects were specific to acute stress. The go on to add that under normal conditions, the loss of MCU appeared to have little to no impact on metabolic function in the heart. The new findings complement work that is ongoing by researchers to better understand heart function and adrenergic (adrenaline-related) signaling in heart cells. In 2013 the lab reported the discovery of MCUR1, a protein in the inner membrane of the mitochondrion that is essential to MCU-mediated calcium uptake. The team plan to continue their investigations of MCU by next looking at its role in chronic stress, which is relevant to conditions such as heart failure and high blood pressure. They are also exploring other calcium handling pathways in heart cells and particularly how calcium escapes from mitochondria. The team surmise that understanding how calcium exchange at the mitochondria is regulated may help target new therapies to preserve energy production in the cell but limit the calcium overload associated with cellular demise. Cardiac contractility is mediated by a variable flux in intracellular calcium (Ca2+), thought to be integrated into mitochondria via the mitochondrial calcium uniporter (MCU) channel to match energetic demand. Here, we examine a conditional, cardiomyocyte-specific, mutant mouse lacking Mcu, the pore-forming subunit of the MCU channel, in adulthood. Mcu−/− mice display no overt baseline phenotype and are protected against mCa2+ overload in an in vivo myocardial ischemia-reperfusion injury model by preventing the activation of the mitochondrial permeability transition pore, decreasing infarct size, and preserving cardiac function. In addition, we find that Mcu−/− mice lack contractile responsiveness to acute β-adrenergic receptor stimulation and in parallel are unable to activate mitochondrial dehydrogenases and display reduced bioenergetic reserve capacity. These results support the hypothesis that MCU may be dispensable for homeostatic cardiac function but required to modulate Ca2+-dependent metabolism during acute stress. The Mitochondrial Calcium Uniporter Matches Energetic Supply with Cardiac Workload during Stress and Modulates Permeability Transition. Elrod et al 2015.